Get notified when Music City Bowl tickets are available! 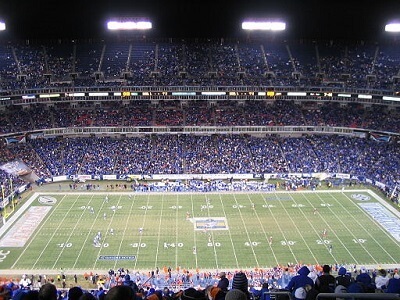 A post-season American college football bowl game that is NCAA certified, the Music City Bowl has been played since the year 1998, in Nashville, Tennessee. This game was once a matchup of the Big East Conference and the Southeastern Conference but the Big East Conference has recently been replaced with the Atlantic Coast Conference. The Music City Bowl shares its games with the TaxSlayer Bowl and gets the second choice of either the Big Ten Teams or the ACC. You can be in the stands to see one of the next bowl games live by purchasing your Music City Bowl tickets now.